Ellis County was bypassed by early Spanish and Mexican explorers in the days before the Republic. It wasn’t until 1842 that the first white person, William Ross Howe (?-1847), settled in the area on the banks of Chambers Creek.1 The area was still sparsely populated in 1849 when records show that it took two tries to find the requisite 100 signatures of persons living in the area to sign a petition to form Ellis County from Navarro County.2 The first census taken in the county in 1850 recorded only 989 people living in the entire county,3 so when the Sims family migrated from Mississippi in 1851, they were truly some of the first pioneers to help in the development of the new county. When the Sims family came to Ellis County, several members of the family settled on and around what would become the foundation for the L.R. Campbell Ranch, later known as the Pecan Springs Ranch, on Chambers Creek. They would own and operate the land for over 150 years. The Sims was an old Virginia family, moving to Maury County, Tennessee in the early 1800s. About 1833, the family migrated to Lafayette County, Mississippi,4 where they were prosperous farmers owning substantial real estate5 and many slaves.6 In 1851, several members of the extended Sims family relocated to Ellis County, first settling along Chambers Creek in the Greathouse area. Over the years, they would purchase thousands of acres along the creek that would stretch from the Boz-Bethel area in the north to Italy in the south.7 They brought with them their farming practices and their slaves, as well as their social and religious institutions. 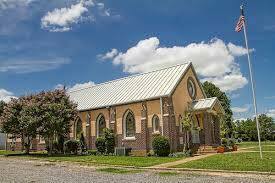 While Ezekial and Lucy Sims Brack continued to live and raise their family in the Greathouse area, John Dabney (J.D.) Sims purchased land farther south. In 1856 Lewis B. DeSpain (1821-10 July 1854) had received a land grant for 640 acres in 1839,15 but no records show that he ever lived on or visited the property, and after his death, J.D. purchased it from DeSpain’s former wife and husband at public auction.16 The southern half of what is known as the L.B. DeSpain survey comprises the northern section of the current Pecan Springs Ranch. It is this property that remained under Sims family ownership for 150 years. In March of 1880, Dabney married for the third and final time. Evelyn Watkins Whitfield (9 November 1849-20 December 1911) was 25 years younger than Dabney, and they had three children: Minnie Evelyn Sims (10 December 1880-28 November 1959), Wilson Dabney Sims Jr. (11 January 1883-8 October 1956), and Patrick Whitfield Sims (25 July 1887-3 October 1936).31 It was on the Merlin property that Dabney chose to make a home for his family. The Dallas Morning News paid high tribute to the last of the Sims pioneers in his obituary: “He was a man of position and decided character…He had the highest integrity. 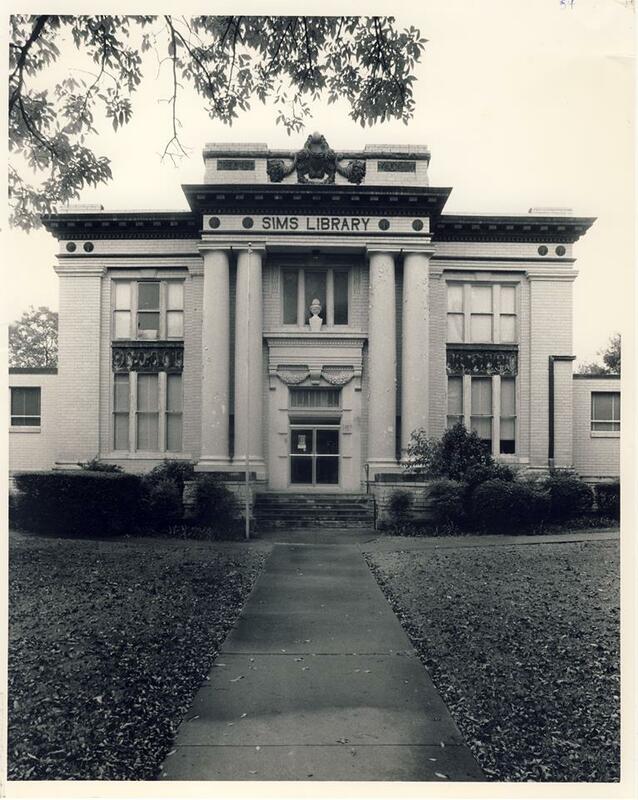 Honesty and morality was Nicholas P. Sims.”39 The formal dedication for the library was held in 1905 and the Waxahachie Daily Light commended the farsightedness of its founder. Nicholas Sims’ will was “a very remarkable instrument in that it made provision for the establishment, maintenance and government of the institution for the present and the future”40 making it “one of the first ten public libraries and one of the first privately owned libraries in Texas.”41 The library has been in continuous operation for over 110 years. The influence of the Sims family in Ellis County continued even after the death of its pioneer ancestors. 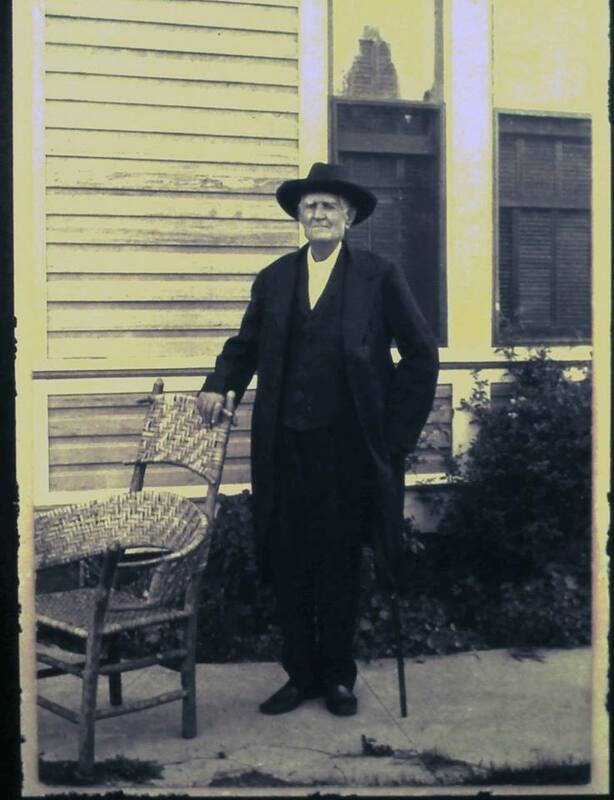 Dabney Sims’ youngest son Patrick had inherited the Sims family farm, part of which is now the Pecan Springs Ranch, after his mother Evelyn’s death in 1911,44 and himself made a cultural contribution to the citizens of the county. Well-known band leader James E. King (25 January 1885-25 July 1947) came to Waxahachie in 1915 and reorganized the Lone Star Band with the assistance of Patrick. King served as the bandmaster, while Patrick was the sponsor and bass drummer. Two years after its re-organization in 1917, the 150-member all-male band played in Washington, D.C., for President Woodrow Wilson. “When the United States entered World War I in the same year, seventy-five bandsmen left for the service. 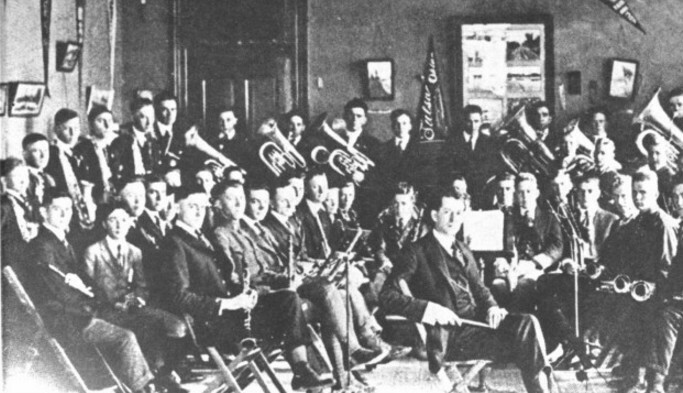 The Lone Star Band provided more musicians for military bands than any other band in the nation…Although the war had taken some of its members, the Lone Star Band in 1918 was chosen the official band for the ex-Confederate Convention”45 traveling all over the United States for concerts and contests, serving as the ambassador of Waxahachie to the nation. Many thanks to Ms. Sharan Farmer, B.A., for her historical research contributions about Pecan Springs Ranch and Ellis County. Ms. Farmer submitted the narrative for The Sims Family to the Ellis County Historical Commission and the Texas Historical Commission. 1 Lavender, James A. The Early Settlement of Ellis County and a Biographical Sketch of the William R. Howe Family. Dallas: n.p., 1941. Granville D. Edwards and Patrick Howe Edwards, 2011. Print. pp. 14-15, 19. 2 “Ellis County, It’s Early Settlers and Organization.” Daughters of the American Revolution. Rebecca Boyce Chapter (Waxahachie, Tex.). Genealogical Records Committee. Texas Genealogical Records, Ellis County, Volume 4, 1790-1955. University of North Texas Libraries, The Portal to Texas History. Web. 11 April 2016. p. 4. 3 Ellis County Historical Commission. “Early Settlement and Organization.” Rootsweb. N.d. Web. 1 February 2016. 4 Farmer, Michal Martin. William Sims born, say, 1655, will made 18 December 1710, James City County, Virginia and his Descendants. Michal M. Farmer, 2011. Web. 28 January 2016. p. 89. 5 Ancestry.com. 1850 United States Federal Census [database on-line]. Provo, Utah: Ancestry.com Operations, Inc., 2010. Web. 19 February 2016. 6 Ancestry.com. 1850 U.S. Federal Census Slave Schedule [database on-line]. Provo, Utah: Ancestry.com Operations, Inc., 2004. Web. 20 February 2016. 7 Farmer, p. 90; Fox, Mary Sondra Horne. The Sims Family: From Virginia to Texas. N.p: n.p., August 2012. Print. p. 56. 9 Ellis County Commissioners Court minutes, Vol. 1, 1850-1857. Print. p. 70. 10 “Greathouse Community.” Ellis County TXGenWeb hosted by Rootsweb, 2002. Web. 12 June 2015. 11 Ellis County Commissioners Court minutes, p. 84. 12 Ellis County Deed Records, Vol. A. Print. p. 127. 13 Elliott, Mary Frances Hampton and Frances Dunaway McGregor. “History of Bethel Church, the Tabernacle and Parsonage.” Searchers and Researchers, Ellis County, Vol. 32, Issue 1. Spring 2009. Print. p. 29. 14 Ellis County Commissioners Court minutes, p. 64. 15 L.B.D. Spain Abstract #969. Texas General Land Office. Land Grant Database. Digital images. Web. 14 January 2016. 16 Ellis County Deed Records, Vol. C. Print. p. 86-88. 17 Ancestry.com. Selected U.S. Federal Census Non-Population Schedules, 1850-1880 (1860 Agricultural Schedule) [database on-line]. Provo, Utah: Ancestry.com Operations, Inc., 2010. Web. 19 February 2016. 18 Ancestry.com. 1860 U.S. Federal Census - Slave Schedules [database on-line]. Provo, Utah: Ancestry.com Operations Inc, 2010. Web. 19 February 2016. 21 “Unique Reunion, Italy, Ellis County, Texas, July 27.” Dallas Morning News. Dallas, Texas, 28 July 1894, p. 3. Published by Michal Farmer, 2011. Web. 21 May 2015. 22 Ancestry.com. 1870 United States Federal Census [database on-line]. Provo, Utah: Ancestry.com Operations, Inc., 2010. Web. 19 February 2016. 23 Farmer, pp. 87, 102, 244. 24 Cross, Clinton F. Eliza Sims and Two Libraries: A Family History. rev. 2013. Published by Magnolias and Peaches, p.19. Web. 28 January 2016; “Wedded at Last.” Jasper Weekly Courier. Jasper, Indiana, 18 January 1878. Published by Hoosier State Chronicles. Web. 29 January 2016. 25 Ellis County Deed Records, Vol. I. Print. p. 414. 26 Ellis County Deed Records, Vol. E. Print. p. 163. 28 “Will of John D. Sims.” Typed copy in N.P. Sims Library, Waxahachie, Texas. Print. 29 Ellis County Deed Records, Vol. S. Print. p. 78-79. 30 Ancestry.com. Selected U.S. Federal Census Non-Population Schedules, 1850-1880 (1880 Agricultural Schedule) [database on-line]. Provo, Utah: Ancestry.com Operations, Inc., 2010. Web. 25 February 2016. 31 Farmer, pp. 244, 251. 32 Campbell family. “History of the Dabney Sims Ranch House.” 1994. Print. 33Memorial and biographical history of Ellis county, Texas ... Containing a history of this important section of the great state of Texas, from the earliest period of its occupancy to the present time, together with glimpses of its future prospects; with full-page portraits of the presidents of the United States, and also full-page portraits of some of the most eminent men of the county, and biographical mention of many of its pioneers, and also of prominent citizens of to-day. Chicago: Lewis Publishing, 1892. Print. p. 253. 34 “Texas Pioneers: Old Texans Meet and Organize Texas Pioneer Association.” The Gazette. Fort Worth, Texas, 22 July 1889. Web. 15 February 2016. 35Will of W.D. Sims, #887, 16 April 1891. Ellis County Clerk. Print. 36 “The Sims Reunion. Incidents of a pleasant gathering of ex-slaves and descendants. Italy, Texas, July 25.” Dallas Morning News. Dallas, Texas, 28 July 1896, p. 6. Published by Michal M. Farmer, 2011. Web. 21 May 2015. 38 “Will of the Late Nicholas P. Sims: Text of the Document Which Made Possible a Public Library and Lyceum in Waxahachie.” Waxahachie Daily Light. Waxahachie, Texas, 26 April 1905. Print. 39 Nicholas P. Sims obituary. Dallas Morning News. Dallas, Texas, 8 June 1902, p. 23. Published by Michal Farmer, 2011. Web. 16 February 2016. 40 “Dedication of N.P. Sims Library.” Waxahachie Daily Light. Waxahachie, Texas, 26 April 1905. Print. 43 Stroud, Mrs. K.G. “The S.M. Dunlap Memorial Library, Italy, Texas.” Daughters of the American Revolution. Rebecca Boyce Chapter (Waxahachie, Tex.) Genealogical Records Committee. Texas Genealogical Records, Ellis County, Volume 21, 1680-1968. University of North Texas Libraries, The Portal to Texas History. Web. 28 January 2016. 44Will of E.W. Sims, #1533, 25 November 1911. Ellis County Clerk. Print. 45 Dorsey, Stuart. “Waxahachie Lone Star Band.” Texas State Historical Association. The Texas Historian, Volume 35, Number 2, November 1974. University of North Texas Libraries, The Portal to Texas History. Web. 5 April 2016. 46Estate of Pat W. Sims, #3119, 9 November 1936. Ellis County Clerk. Print; Ellis County Deed Records, Vol. 338, p. 528-534. Print. 47 Roberts, Terri L. “The History of Pecan Springs Ranch.” Research project for Southwestern Assemblies of God University, Waxahachie, Texas. Spring 2015. Print. p. 35. 48 William Dabney ‘Bill’ Campbell obituary. Amarillo Globe-News. Amarillo, Texas, 15 December 2008. Published by Find-a-Grave. Web. 9 February 2016. 49Will of Minnie Sims Campbell, #5136, 16 February 1960. Ellis County Clerk. Print; Will of Lee R. Campbell, #5223, 14 February 1945. Ellis County Clerk. Print. 50 Ellis County Deed Records [database on-line], Vol. 852, p. 804-813. Web. 18 February 2016. 51 Ellis County Deed Records [database on-line], Book 2418, p. 1168-1175. Web. 18 February 2016. 52 Ellis County Deed Records [database on-line], Book 2632, p. 1168-1178. Web. 18 February 2016. 54 “Dabney Sims, Pecan Specialist.” Dallas Morning News. Dallas, Texas, 18 September 1937, p. 2. Published by Michal M. Farmer, 2011. Web. 16 February 2016. 55 Stout, Judge A.R. “Political History,” History of Ellis County, Texas. Waco: Texian Press, 1972. Print. p. 283. Current Bethel United Methodist Church where Sims family members continue to worship and a Sims descendant serves as pastor. Founded by members of the original Sims pioneer family.